The conflict between good and evil can be found in every culture, mythical tradition, and religion throughout history. In many cases, the source of evil has been personified as demons or devils, and in many belief systems, both are considered to be real entities operating outside the boundaries of the physical world to torment people or lead them astray. In some traditions demons are believed to be the direct opposite of angels, working against the forces of good and challenging them. Real or not, demons are at the heart of many fascinating beliefs and traditions, several of which are widely held today. The Encyclopedia of Demons and Demonology explores this dark aspect of folklore and religion and the role that demons play in the modern world. 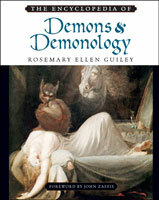 This comprehensive resource presents more than 400 entries and more than 80 black-and-white photographs documenting beliefs about demons and demonology from ancient history to the present.